A couple of years ago, we told you about a little establishment on Cleveland Avenue called Sandwich Farm. We loved Sandwich Farm, the concept, the food, the cute sandwich posters and the creativity, so we were sad when we found out Sandwich Farm was going to close. Even though we were aware it was closing because a new restaurant was moving into the same complex, we were hated to see Sandwich Farm go. Well, the new restaurant, A.M. Booth's Lumberyard is now a reality and we just had to go check it out. It is one door down from where the old Sandwich Farm was located and it seems to be so much more than just a restaurant. The name, A.M. Booth's Lumberyard, derives from a real person, A.M. Booth, who opened the lumberyard in 1895. He was also a contractor who built more than 1100 homes in Huntsville and Madison County. The lumberyard closed in the 1950's and, for a while, was home to an auto parts store. The space sat vacant for many years until Sandwich Farm and a bar, called the Lone Goose Saloon, breathed new life into the rundown facility. Now new changes are afoot. Sandwich Farm and Lone Goose Saloon are gone and the entire lumberyard is being turned into a restaurant and event venue, with different types of entertainment planned for the different areas of the old lumberyard. The first time we were there, workers were setting up for an outdoor wedding reception in the center of the complex. The new restaurant, A.M. Booth's Lumberyard incorporates many of the dishes and character of Sandwich Farm, but with its own unique personality. Like Sandwich Farm, the menu changes and rotates. On our first visit, our meal looked like this. I had a skillet burger with sweet potato fries. The fries were just like the ones I had loved so much at Sandwich Farm, so I was really happy about that. The thick burger was cooked medium well, topped with red onion, tomato, romaine and cheese (your choice). It was an excellent burger. If you like your burger more well done, you probably need to let your server know. Scott chose a turkey sandwich with avocado, havarti, romaine and garlic mayo. He decided to have regular fries with his sandwich. They were also delicious. The mayo was very garlicky, so if you are sensitive to garlic or, perhaps just don't want to smell like garlic, ask for it to be served on the side. On a recent return visit with friends, I started with a bowl of super thick minestrone. It had lots of tomatoes and was served with a crusty hunk of bread. I liked it very much. It was like a bowl of seasoned stewed tomatoes with a few other veggies thrown in for good measure. The roast beef sandwich was served on the same crusty bread with romaine, tomato, red onion, cheddar and horseradish mayonnaise. The beef was medium rare and sliced thin. It was a very good sandwich. Here are the crab cakes my friends ordered. They arrived on a bed of shredded potato cakes and were topped with tartar sauce and chopped chives. Crispy on the outside and crabby, not bready, these crab cakes were excellent. My buddies got smoky mac and cheese with their crab cakes, because smoky mac and cheese is just too hard to pass up and because you just can't have enough carby goodness. I didn't taste the cheesy shells, but they were gone, so they must have been good. One thing we haven't tried that sounds interesting are A.M. Booth's Smoke Stacks. They are rice bowls you build yourself. You start with a bowl of organic brown rice and top it with one meat, three sides and one sauce. The meat choices are white beans, chicken, pork, brisket, shrimp or salmon. The sides include edemame, carrots, marinated mushrooms and onions, green beans, pickled beets, kale slaw, soft boiled egg or pickled vegetables. The sauces are sweet and spicy, chimichurri, pineapple and sriracha, roasted garlic tahini and romesco. If you try one of these bowls, we would love to hear what you think. Be sure to wander around the complex when you finish your meal. There are a couple of shops. Domaine South has fine wines, local beer, Alabama made gifts and many items from the shops at Lowe Mill. We saw chocolate from Pizzelles and tea from Piper and Leaf. They also carry those delicious, Huntsville-made, Jala-Jala jellies. If you haven't tried these, you should. We can especially recommend the Black Widow, made with blackberries and jalapeño peppers. The Indigo Shoppe has women's clothing, accessories and art and is described as boho boutique. We haven't gotten to visit it, yet, but we plan to on our next trip to the lumberyard. If anyone knows what Tupelo Mist Cornballs are, we would love to know. We asked, but the staff was about as perplexed as we were. They thought it had something to do with a movie. 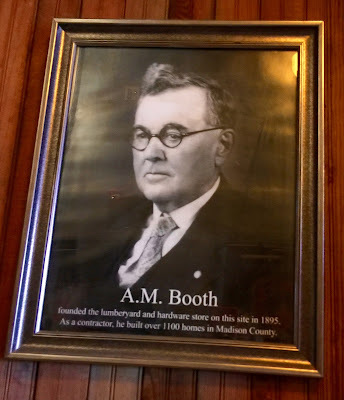 We love the things that are going on at A.M. Booth's Lumberyard and we feel Mr. Booth would be thrilled to know that his old lumberyard has been given a new life. Check it out! Three Friends and a Fork give A.M. Booth's Lumberyard 3 Nostalgic Yums UP!